Here's a gnat's-eye view at the face of a nut as seen from the leeward side of the second fret. The slots for these two strings are cut so that they completely support the string. The sketch above relates to fretted instruments, but the basic principles are no different for violin family and other unfretted instruments. I'll try to explain the clearance in a minute. Having the slot cut too high above the frets (or an unfretted board of some type) means that the act of pressing the string down to the first few frets actually stretches the string, raising the pitch and throwing the intonation off in the process. Ideally, the nut slot height is identical to any other fret. But remember that strings can 'saw' themselves through a nut just through normal use. I ordinarily leave a nut slot a little higher than necessary at first, to allow for the string to cut itself a little lower. I also avoid synthetic and elephant ivory, both of which are too soft and rubbery to make good nuts for steel strings. These slots are all too deep, but the B is still so high it doesn't play in tune, so someone shoved a piece of ebony under it to try and correct the intonation. Big "Ugh" for this one. When you tune, you always tune up to a note, never down, right? Right. It's about friction in the slot. And with a poorly cut nut, when you tune up, the tension on the length of string between the nut and the string post is greater (per unit of length) than the part you actually play, that's between the nut and the bridge. After getting the pitch just right, a bit of actual playing works the string, making the tension on both sides of the nut equalize, and voilà: you're out of tune in mid-phrase. It has nothing to do with the tuning machines, which people just love to blame, but everything to do with setup, particularly how precisely the string slots at the nut are cut. The string is a superb straightedge when it's under tension. This assumes the frets are really true and level. The sketch below illustrates how - and how not - to shape a slot for any string. 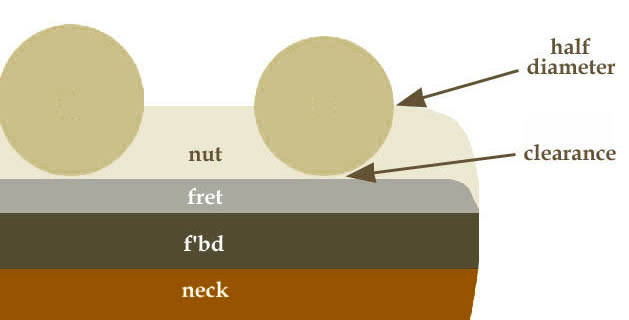 Left: like the messy nut above, the nut material is too high. You need only enough to support half the diameter of the string. Anything more is just in the way. When the string is way below the top of the nut, you have great difficulty telling whether it's seating properly. Next: a slot that's cut with a saw has a roughly flat bottom and also affords poor acoustic coupling. Saws seldom match the precise width of the string, which can roll side to side in the slot. Next: strings will work their way down a v-cut, often bottoming out on frets (or the board, as the case may be with fretless instruments). The signal transfer is compromised because of the limited contact, and the string sizzles on the fret or the board. They also tend to bind and squeak. They can ruin your day. 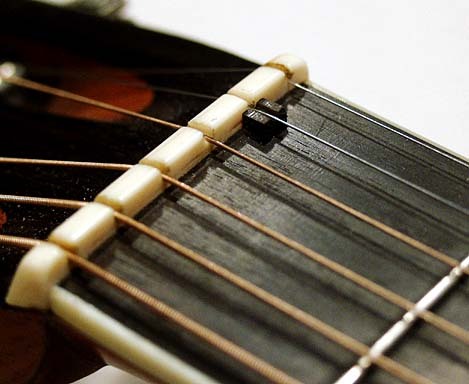 Right: the slot really fits the diameter of the string, the nut material does not go above the halfway point of that diameter, and leaves the string a trace of clearance above the fret or the unfretted board surface. How much is a trace? I'm reluctant to assign a measurement—it's very little. You can still see a bit of light. If you hold any string down on any fret of a well set up instrument, you'll see that same preferred clearance at the next fret up. Before going further, here's how to correct a string slot that's too low. Often it's wiser to repair a blown slot than it is to replace the whole nut. Quick fixes like some kind of dust (bone, acrylic, baking soda) with superglue are really temporary. It takes little more effort to implant a little patch of bone (or even pearl) into the nut and recut the slot. It's as good as the original, and if done well, is quite invisible. Trim and dress the nut as if it was new and uncut, then cut the new slot. The slot itself needs to be shaped in a way that it not only fits the diameter of each individual string, but also such that the string has firm contact with the nut at the very front of the slot. This defines the end of the vibrating string length, and if it's not right, intonation will be impaired at the very least, and you may well find your string sizzling like a sitar string. The point of this is to offer a smooth surface for the string to travel from the tuning machine to the critical point of final contact at the front of the slot, where it is held firmly to define the end of the vibrating string length. The bell here is imaginary. 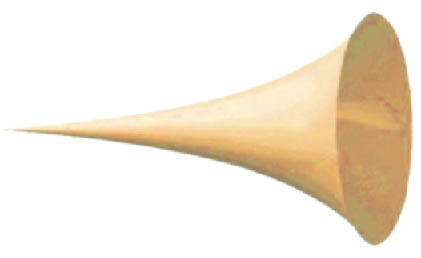 The nut is in yellow, the fingerboard is dark brown. 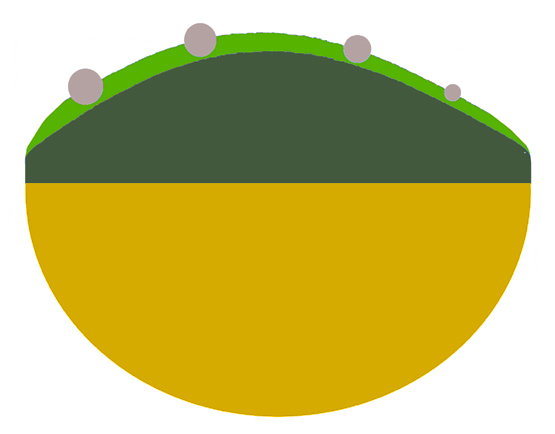 The string is the green line, and the tuning machines are off to the right somewhere. 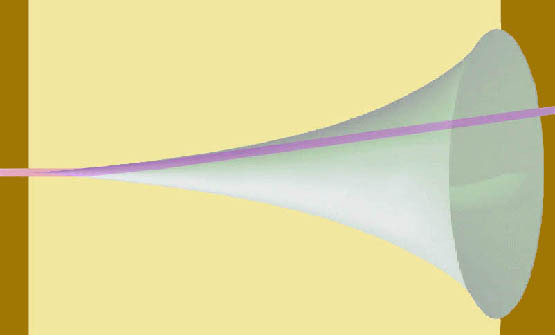 Notice that the string connects with a smooth curved surface, no corner or edge. Whether the string is coming from the top or the bottom of the string post, it will slide smoothly into the nut slot. The string is in complete contact with the front 30% of the nut. There's plenty of substance there to keep the string from sawing its way deeper into the bone. The string's other curve, from, say, the farthest peg on the bass side of the headstock, also elides with the inside of the bell-shaped slot, guided gently and directly to the front where it's held firmly by its own tension inside the confines of a well cut slot. If the slot isn't properly angled back, several problems can arise. The precise shape of the slot at the front edge is extremely important for sound quality, stability of the setup, and intonation. More on bridges in due time, but the principles here apply to bridge slots on the viol and violin families, guitars, mandolins, and so on. Here's a page on the files and so on you need to cut nuts. Back to the repair index page.